Gift of Play September 10th 2016, DB lab group participates. The KNES Team was painting lines in the NW and it was a tad windy. We preserved and completed our four schools. Thanks to Eshleen Grewal and Kayla Kashluba, new trainees in the lab for coming out on Saturday. Shout out to Catherine Tremblay, a Faculty of Kinesiology student, who took on part of the Gift of Play project as a directed study placement during the 2016 spring semester. She compiled all the research to support the project and chose the playground stencils that were painted at 50 recipient schools across the city. Doyle-Baker Lab Delegates at the 2015 International Conference on Health Promoting Universities and Colleges. From left to right: Brendan Concannon, Benji Smith, Dr. Doyle-Baker, Louise Smith, and Kaitlyn Verge. 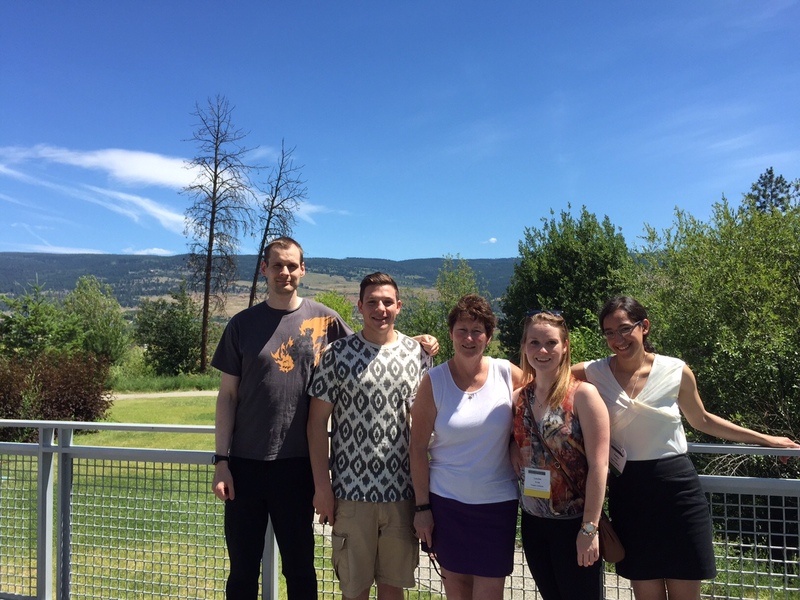 The 2015 International Conference on Health Promoting Universities and Colleges/VII International Congress – hosted in Kelowna, British Columbia, Canada – created a dynamic meeting place for researchers, practitioners, administrators, students and policy-makers from around the world. Doyle-Baker Lab delegates explored pressing issues and identified promising paths for healthy and sustainable campus development. All of us were able to co-designand sign the new international Charter. 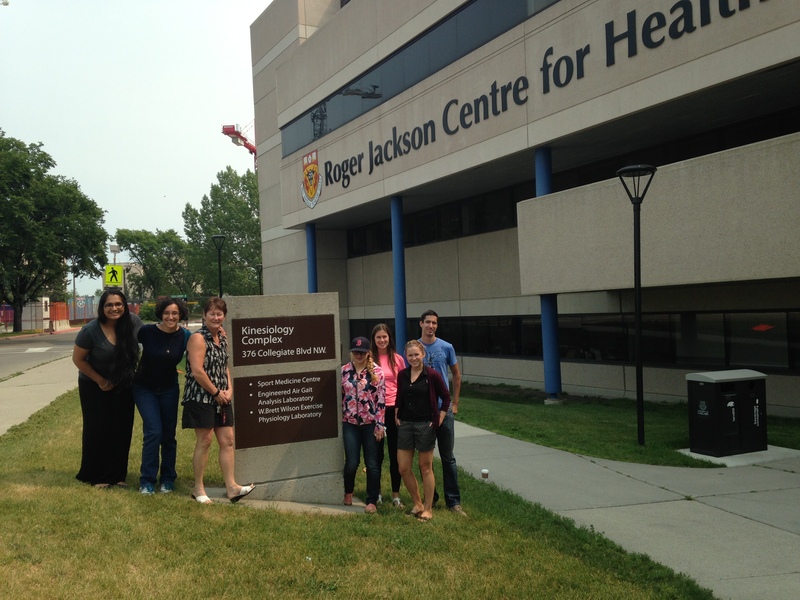 Dr. Doyle-Baker and her lab group would like to congratulate their colleague, Chantal Loeppky, who has been informed of her acceptance to the University of Alberta’s Medical Doctorate program. Chantal is currently working on the FORAGE study within the DBL, and will be moving to Edmonton, Alberta to pursue this next chapter in her life come late August. Doyle-Baker Lab summer student Mike Christie recently gave a presentation to a sports medicine class at West Island College about some trends in the field. Mike spoke to grade 10 and 11 students about the science behind concussions and Chronic Traumatic Encephalopathy, his ACLR-START study investigating ACL injury in skiers, the increasing trend of obesity in society, and the use of exercise to help manage mental health. The students, many of whom are interested in pursuing sports medicine as a career, had many insightful comments and questions. As a West Island College alumnus, Mike thoroughly enjoyed presenting to this group of students and would like to thank Coach Rav Grewal for the invitation to speak. 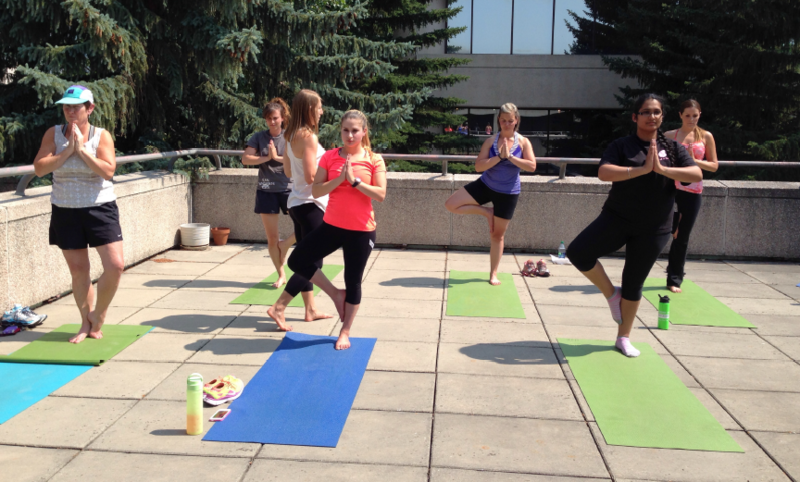 The DBL participated in rooftop yoga at the university in July. There is currently work to transform this rooftop space into an area that will contribute to a positive social and physical environment at work for all students and staff. The Kinesiology Graduate Student Association put on a curling bonspiel in March. After much slipping and sliding around, the Doyle-Baker emerged undefeated! 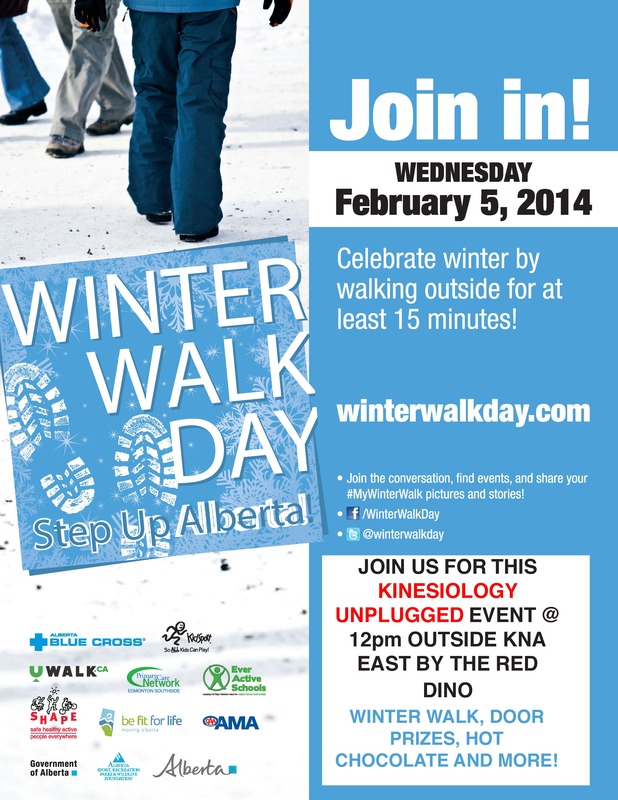 As a lab, we participated in the Winter Walk Day on February 5th, 2014. It was a brisk walk outside in freezing temperatures… By dressing warm and staying active, we were able to enjoy the beautiful sunny day in Calgary! Hot chocolate really does taste that much better after a brisk walk outside. We took a hike around Grassi Lakes in September. It’s just outside of Canmore, and has two beautiful crystal clear lakes at the top. It’s a rewarding hike but is also feasible for beginners!